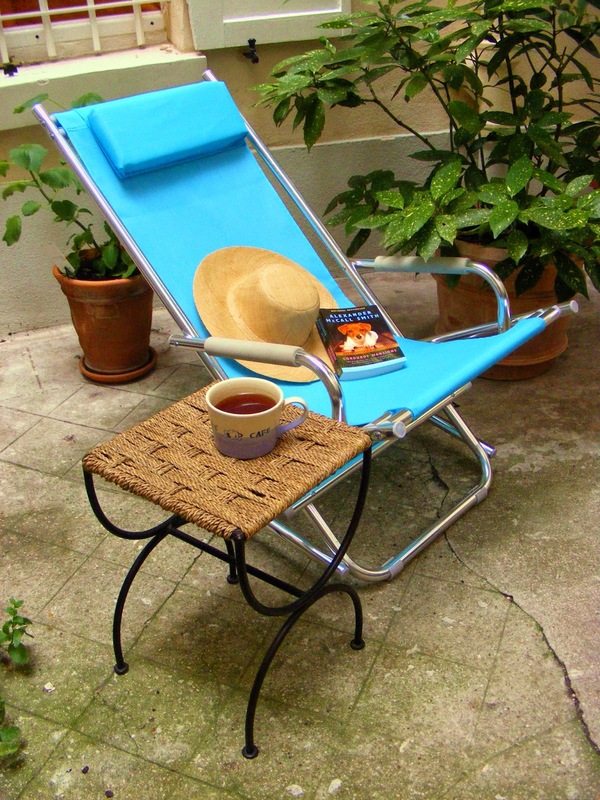 As many of my friends like to hear about my Paris garden, I’ve decided to write about what it takes to maintain a garden in Montmartre, tiny though it may be. Life in Paris is many things. One thing it usually is not is a private garden. Which is why I'm very lucky to have found this small patch in Montmartre. It's well hidden behind two sets of doors and a weathered white gate. The garden shields me from the rest of the building and the building in return shields the garden from the noise of the street. It’s its own little world, peopled only by me, invited guests and a merle chanteur, a singing blackbird like the one in the Beatles song. The climate of the City of Light is milder than it should be at this latitude (the same as Labrador). It’s semi-oceanic, the Atlantic being just 125 miles down the Seine River, so although Paris does have four seasons, plants can still over-winter outdoors. Occasionally I’ll fall in love with a climatically unsuitable plant, such as the luxuriant white Stephanotis floribunda that I planted in the ground, not knowing it was a semi-tropical jasmine from Madagascar. It froze to death in the harshest winter Paris had known in decades. But all in all, the survival rate among my perennials is good. Winding gracefully up the trellis are different types of ivy. There were also two clematis, but one was uprooted by someone while I was gone. I don’t know who would do that, or why, but it left the trellis pretty bare, so I found a wonderful pink climbing rosebush, a Pierre de Ronsard, named after the 16th century French poet who wrote “Mignonne, allons voir si la rose / Qui ce matin avait déclose...”, his warning to the young Cassandre that roses, like her youth, last but a moment. (My medieval French professor, Guy Mermier, would be so proud I remembered that!) Pierre is now settling in near a dark pink peony in the corner and I hope they find there’s enough sun and water to want to stick around. Maybe I should name her Cassandre. On the less-shaded north perimeter of the garden proper, there are three different roses given to me or my family over the years. They don’t bear too many flowers but they keep their green leaves all year round, and that’s welcome in the greyness of winter. They share space with hyacinths that grow back every spring from their bulbs, which I’ve planted over the years after they finish gracing my interior with their flowers and fragrance. There’s also a fuchsia that replaced the one that perished in The Great Freeze of 20012-13, and I was glad to see new sprouts - something I always hope for. Edging all this are many campanula, with their tiny lavender bells. Those that get the most sun give the most flowers, but even in the shade their leaves last year-round. All this needs tending when I arrive, but it’s there waiting faithfully in any season. That leaves, however, the annuals. Which, as their name implies, have to be replaced annually. In addition to this in-ground section, there are planters on the patio along all three walls of the garden, as well as six more hanging from my wall of windows. In them are some perennials, such as ivy, but every year I add a few carnations or marigolds for a touch of color, and last fall’s pansies have reflowered to add yet another shade to the palette. In prevision of the rest of the summer, I seeded some nasturtiums to spill down the front of the boxes, and blue morning glory seeds in the back that sprouted within the week and are already plotting to climb up the windows. But for anything a bit more exotic, you need to cart yourself across town to Truffaut Nurseries. The trip entails two different Métro lines, but with a good book that goes by fast. The problem comes in bringing home the booty. This time, I went there to buy some hostas for the Very Dark Place at the foot of the cherry laurel where a maidenhair fern seems to enjoy it, and also a blueberry bush to keep the blackberry company. Unfortunately for me, I’m rarely in Paris when the berries appear, but that may be one reason the merle chanteur has elected residence in our courtyard. One year he, or a relative, stole my cherry tomatoes just before they were ripe, leaving behind only the inedible green stem for me. As for my herbs, most of them are in colorful ceramic pots that could be taken indoors when it gets cold, but I never do. I leave them out so my friends on other floors can snip off some for their cooking when I’m not around. And even when I am, the herbs grow faster than I can use them up. Some of the herbs are old friends. The bay leaf plant, for example, has grown tall and lanky over the years, reaching upward for the light. To keep him company, I’ve planted some flowing oregano at his base. I don’t think they’ll cross-pollinate and create a new breed of herb, but you never know once your back is turned. There are also two rosemary plants that haven’t achieved bush-hood but have valiantly faced several winters far from their Mediterranean homeland without too much complaining. The verbena is also frail but undaunted over two years. The mint - which usually is one of the plagues of Egypt if not contained - has been very discreet, so I planted a brand new one among its tiny vestiges, just to cheer it up. And then there are the herbs that need to be replaced every year. Basil, of course - without which I wouldn’t know how to cook. And parsley, which is a bit of a finicky, whining plant, but again necessary for French cooking. Not to mention thyme, also a Mediterranean plant but less robust than its compatriot, rosemary. This year I’ve planted some chive in a bigger planter, hoping it’ll stay around or pop back up in the spring, like my chive does in Michigan. Same with the sage, but maybe I should have put it in a bigger pot if I want it to persevere. Anyway, time will tell. Every spring I have to refresh the entire tableau. But as my grandfather used to say, it keeps me out of the pool hall. Paris started out as an island. And whenever there's an island, sooner or later there's a bridge. Paris has 37 in all, if you count just those spanning the River Seine. There are others crossing the city’s canals. And a few for roads that crisscross over each other. Two of the river bridges were built for pedestrians only. One, the last bridge built over the Seine, was inaugurated in 2006 and dedicated to French writer Simone de Beauvoir. The other is the Pont des Arts. Built under Napoleon Bonaparte in 1802, it links the Tuileries Gardens of the Louvre Palace, now a world-famous art museum, with what I think is the most beautiful building in Paris: the Institut de France, where the Académie Française sits and ponders which words should be accepted into the French language and win a place in the dictionary. For almost two centuries, the lace-like Pont des Arts offered a haven of peace, open only to pedestrians and bicycles. A place to stand and watch the river flow by to the sea. Of course there have been the normal mishaps - normal for a bridge, at least. There were two aerial bombardments in World Wars I and II. And many, many collisions with boats, most notably in 1979 when a barge took out a whomping 60 meters of it (about 200 ft). And so it was closed while repairs were made. The idea was to more or less rebuild it to the original design but with modern materials. I say more or less because its nine arches were reduced to seven so that it would “match” its neighbor, the Pont-Neuf, which has seven. (The French are big on symmetry.) After five years of work, the bridge reopened in 1984. Then someone made a movie. 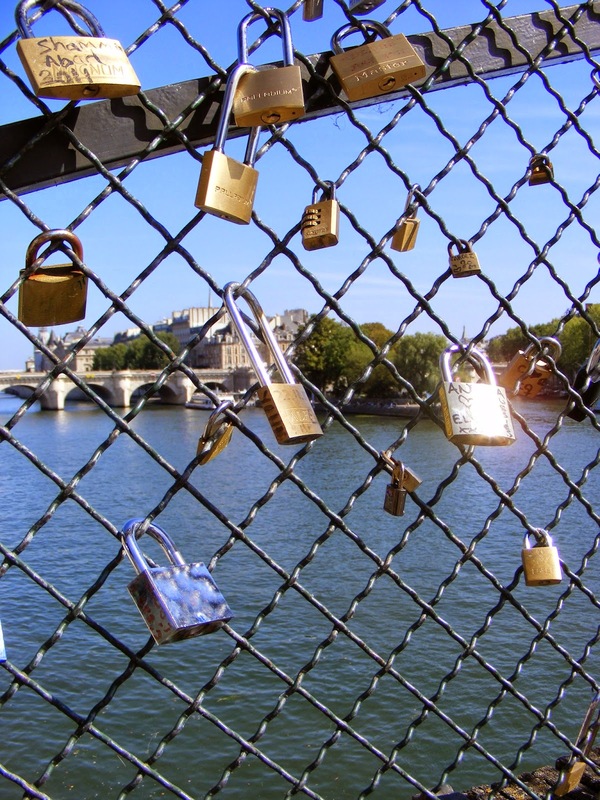 Ever since the 1991 film Les Amants du Pont-Neuf, lovers - whether Parisians or tourists - have been attaching a padlock to the bridge's railing and then throwing the key into the Seine below. If you don’t come equipped, you can buy one from the bouquinistes, the booksellers along the banks of the river. Somewhat like throwing three coins into the Trevi Fountain in Rome to ensure you’ll return to the Eternal City, throwing the padlock’s key into the Seine is supposed to declare and preserve your eternal love for each other. I've never heard of anyone being injured by one of the keys falling on them from above, but cargo barges as well as many, many tour boats - the famous bateaux-mouches - cruise back and forth beneath it every day. No, the real problem is that padlocks are heavy. And when the bridge's entire railing is chock-a-block full of them from one bank of the Seine to the other, and on both sides... well, that wasn't in the original specifications of this lightweight pedestrian bridge. Nor those of its renovators either. The City of Paris asked people not to do this any more. They said the metal bridge could only bear so much weight. Now they're asking lovers to tie ribbons instead, as a pledge of their undying love. But when did lovers ever listen to anybody? Fifteen years after the movie hit the Silver Screen, disaster hit the bridge. And not in the form of yet another barge crashing into it. No. This time 2½ meters (8 ft) of railing collapsed under the weight of all those padlocks. There was a preview of this kind of problem last summer when one small section gave way, but this was far more spectacular. So the bridge is closed once again while city workers saw off all the eternal locks. Lovers, please go elsewhere! It'll be interesting to know how much all those love locks end up weighing. And whether, as a result, there’ll be a rash of divorces around the globe. N.B. My pre-lock photos date back to 2007 and 2008. My photo of the love locks was taken in 2011. There was still plenty of empty space back then. Now it's hard to find a place to put a new lock! As you can see in the photo on the left, taken June 13, 2014. The other photo shows the replaced section installed on Monday, already well on its way to being equally padlocked a short five days later. The rapid appearance of the Love Locks isn't surprising, given there were six young men selling padlocks on the bridge itself on this sunny day. Mark had been in the Army during World War II, and was sent to Normandy a few days after D-Day to help with the provisioning of the invasion forces. The famous caisson harbor had been towed across the Channel to Arromanches so that ships could dock out where there was enough depth and jeeps and trucks could just be driven off and down along the caissons to shore. 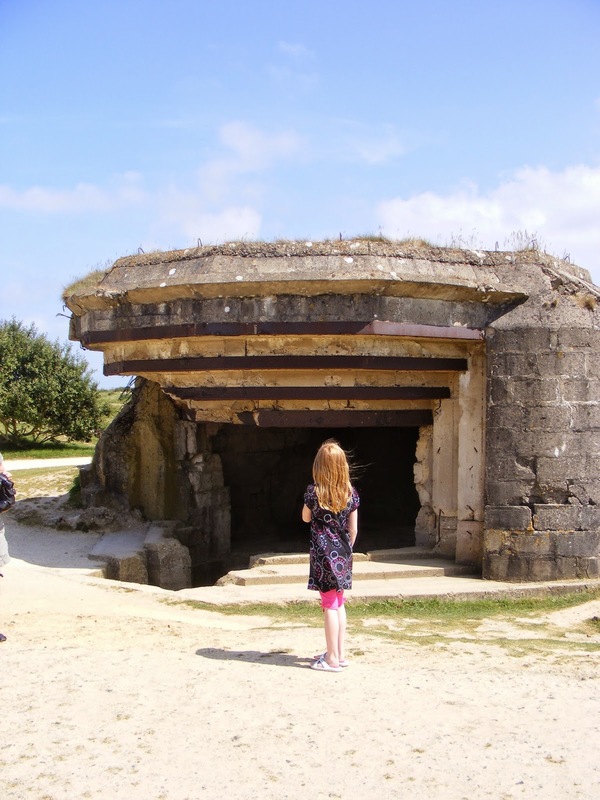 I took Mark and his family on a tour of France, which logically included the Normandy beaches. He was in his sixties by then. Usually a rather chatty guy, I watched him on Omaha Beach, standing off a bit as the rest of us ate our picnic lunch. He stood silent, watching a boy throw a stick into the water for his dog to fetch... A couple walk hand in hand along the sand... An old gentleman take his constitutional with the help of a cane. “Mark, are you all right?” I asked, struck by his uncharacteristic silence. After lunch, some of my flock wanted a coffee. I drove them breezily along the crest of the bluff that so many soldiers died trying to reach. We found a bar/café at a crossroads out in the middle of nowhere, among the fields. Inside, standing at the bar, were farmers in muddy rubber boots and faded blue work overalls, talking and having a beverage of their choice. The six of us sat down at one of the tables, which were all empty. I took everyone’s order and went up to the bar. The sixty-something year old gentleman behind the bar - probably the owner - took our order and brought it to our table. After a while, we were ready to get on with the day’s tour. We stopped at the bar to pay our bill. “Combien on vous doit?” I asked the gentleman. How much do we owe you? I speak without an accent, I’m told, but my wards had been merrily chatting away in English. “Américains?” he asked, looking them over in turn. “Yes,” I answered, not knowing where this was going. “C’est déjà payé.” he replied. It’s already paid for. I looked around at the men standing at the bar, wondering why one of them had paid for us. June 6th, 1944. That horror-yet-hope-filled day when the Allies swarmed the quiet beaches of this peaceful region filled with apple trees and dairy cows. Divvied up between them, the British troops got Sword Beach, to the far east nearest the Orne River and what would become the Pegasus Bridge across to Berlin - and Gold Beach farther west. Between them, the Canadians took Juno. The Americans got flat, wide, sandy Utah Beach on the far western end... and they also got the short end of the stick at the bluffs of narrow Omaha Beach, where 2,500 died. Between those two “American” beaches is a headland: the Pointe du Hoc. With its view of the coast both east and west, it’s a place that puts things into perspective. Quickly. There are some platforms overlooking the English Channel on one side and the remaining Nazi blockhouses on the other. The plateau stretching all around is still pockmarked with deep craters, now green with wild grass, craters made all those decades ago by incoming bombs. A few years after Mark and his family, I was there on another tour of the Normandy Beaches. We ran into a busload of tourists with a guide and she was explaining to her group what they were seeing: the cliff, the blockhouses, the rusting cannons, the craters... Everyone was rapt, except for a handful of elderly gentlemen. They were standing together, looking out over the water, their eyes lost in something the rest of us couldn’t see, hearing things we couldn’t hear. When the guide was through and most of the tourists were heading off to the bus and their next stop, those old men hung back. I went over to one of them, the one closest to me. “Were you here on that day?” I asked. He seemed perplexed and looked briefly at his friends, all other veterans. Then he took my hand, shook it, looked down at his shoes and moved off. Overlooking Omaha Beach, at the top of the vertical bluff, is the American Cemetery, on land which has been donated to the United States in perpetuity. In it are buried 9,387 Americans who gave their lives to free Europe and the world of Nazi totalitarianism. My tourists always want to go there. I take them near closing time, when it’s more calm and most of the tourists have left. It’s most beautiful at that time, and you can hear your thoughts better. Your thoughts, and the memories. A few short months after taking office, President Obama came here on the 65th anniversary of the Allied landings. He gave a speech early in the morning, around the time the first assault started. I was there the day before the ceremony. The red carpet was already out, the folding chairs set up. Now he's back for the 70th anniversary. Even fewer veterans will be present. The ones who haven’t died are probably too old for such a long trip. And yet it’s a long trip that is still easier than the one they made on June 6th seventy years ago. Not all D-Day victims came from far away.